Typing was once relegated to the likes of receptionists and writers, but now just about everyone in the developed world knows how to use a keyboard. What would happen if we all had to relearn the way we type? Would it be complete pandemonium or would folks embrace the new layout and welcome the new addition to their set of typing skills? The answer probably lies somewhere between the two, as evidenced by the lukewarm reception to a new type of keyboard available for Android tablets 7″ and above. The Slice Keyboard app uses both hands for typing, a fact that already has seasoned text messaging addicts cringing. 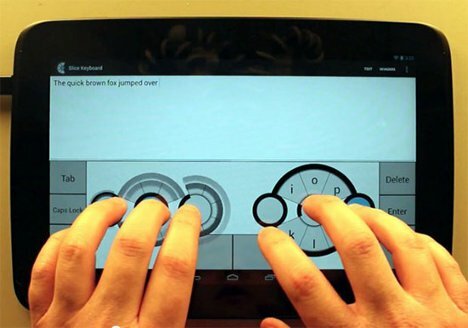 Each finger resting on the touch screen represents an assigned configuration of characters. When the typer wants to select a certain character, he presses down on the appropriate finger, then selects the wanted caracter.,m According to the developers, the app can be used for touch typing and eliminates the need to look at the hands or keyboard while typing. We’re assuming that’s after a lengthy learning process. The app comes with a Space Invaders-type game to help along the learning curve, so it might be worth at least trying – if you’re an adventurous typist, that is. See more in Phones & Mobile or under Gadgets. December, 2012.